Capt. 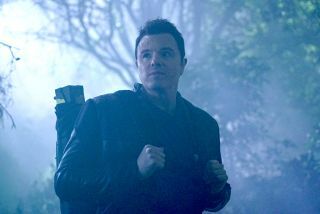 Ed Mercer (Seth MacFarlane) in "The Orville" episode "Nothing Left on Earth Excepting Fishes." Straight out of the starting blocks, this episode, called "Nothing Left on Earth Excepting Fishes," looks interesting. Lt. Tharl (Patrick Warburton) makes a welcome return to the bridge, brandishing his unique brand of still-awkward-new-crewmember humor and proving that this could be developed into something very amusing. We very much hope he doesn't disappear too soon. Mercer consults with his best friend, Lt. Gordon Malloy (Scott Grimes), and decides he should inform his ex-wife and first officer, Cmdr. Kelly Grayson (Adrianne Palicki), that he's now dating someone. While en route to their romantic getaway, the shuttlecraft encounters three Marauder-class Krill fighters. Despite cloaking, the fighters are able to detect them and disable their ship. An enormous Krill cruiser appears above them and, using a tractor beam, the shuttlecraft is taken inside. Aboard the Orville, Malloy announces to Grayson that he'd like to be put forward for the shipmaster qualification program. In a cell aboard the Krill cruiser, Mercer is being threatened with torture unless he hands over his command codes so that the Krill commander can access the Planetary Union deployment strategies or some such thing. As a further incentive, he's shown Tyler being tortured. "Alpha Charlie, 27 Gamma 42 Delta 6…" Mercer says, sighing. Meanwhile, the first step to Malloy's first command is a medical and psychological evaluation by Dr. Finn (Penny Johnson Jerald). While undergoing a digital Rorschach test, he freaks out and says that he'd really rather not say what each shape reminds him of … so the good doctor instead suggests that they move on to the simulator test. Each subplot scene lasts only seconds before it cuts back to the Krill ship, so that's clearly where the focus is. Then something a little crazy happens: A female Krill enters the prison cell and tells Mercer how much she has been looking forward to this moment. The crazy thing is, she's played by Michaela McManus, the same actor who is playing Lt. Janel Tyler. Is there some secret Krill-human subterfuge at work? The Krill female is Teleya, the teacher aboard the Krill cruiser that Malloy and Mercer infiltrated in the Season 1 episode "Krill" (S01, E06) wearing personal holographic projectors in what started as a peaceful attempt to learn more about the Krill and their sacred book of Anhkana. Has she been wearing a similar personal projector and successfully remained aboard the Orville all this time without detection? Has Mercer been snogging a Krill the past few days? The answer is…yes, it is indeed the same character! Holy holograms. Who'd have thought?! Except, she hasn't been wearing any kind of projection device, she underwent surgery: an extremely painful trans-cellular micro-grafting procedure that offered the only way to fool the Orville's bio-scanners. The impersonation trope is familiar in TV sci-fi: In "Star Trek: Deep Space Nine," Dukat was a Bajoran in much of Season 7; "Star Trek: Voyager" had Seeska and even in "The Original Series" the Klingon Arne Darvin was surgically altered to appear human — a forerunner to the events of "Star Trek: Discovery" where the Klingon Voq was also altered to appear human and then assumed the identity of a captured Starfleet officer, Lt. Ash Tyler. However, the facts that the story arc was relatively recent and both altered subjects are called Tyler is probably going to cause a bit of a commotion online for a while. Suddenly, this episode takes a turn for the very serious and indeed the rather dark. Apparently, Teleya was tortured by the Planetary Union — which seems odd; you'd think they'd be above that sort of thing — but she escaped back to Krill space. When she learned of a Krill plan to capture the captain of a Planetary Union starship, she volunteered for the mission. Capt. Ed Mercer (Seth MacFarlane) and Lt. Janel Tyler (Michaela McManus) watch Yul Brynner in "The King and I," which is where the episode title "Nothing Left on Earth Excepting Fishes” comes from. Suddenly, the Krill cruiser comes under attack by an even bigger alien ship and several fighters. The energy shield to Mercer's cell deactivates and he takes out the guard and points the gun at Teleya. The pod automatically takes them to the nearest planet with a breathable atmosphere. It crashes in a valley where the magnetic properties of the ore in the ground prevent a distress signal from being sent, and so they must work together. Or at the very least, the one without the gun must work for the one with the gun. In a tension-relieving interlude, we return to the Orville where we see Malloy attempting to negotiate with a Krill captain, by coincidence, in a holodeck simulation. It doesn't go well. And then we're back on the planet with Teleya and Mercer. As the two slowly make their way to higher ground, the conversation takes a familiar MacFarlane route down Pop Culture Road as they discuss all the movies they watched together when Teleya was Tyler. Turns out she was a fan of "Raiders of the Lost Ark." Capt. Ed Mercer (Seth MacFarlane) and Lt. Janel Tyler (Michaela McManus) leave the Orville to plan a romantic getaway. "I found the hero … sympathetic. What was his name?" Teleya asks. "Belloq," she says, answering her own question and happy that she's remembered. Naturally, Mercer's reaction is similar to the viewers'. It's a very funny and nicely put together scene. Knowing there's now a reference to "Raiders of the Lost Ark" in this episode, you can spot similarities between the music score here and that classic 1981 movie, from the intense firefight earlier to the slow walk through this planet's jungle canopy. They continue to talk, and Mercer insists that she felt something for him while she was Tyler in an effort to get through to her compassionate side. Their alien attackers are now hot on their trail in pursuit. With daybreak fast approaching — ultraviolet light burns the Krill, don't forget — they take shelter to wait out the day in a nearby cave. Back on the ship, Malloy gives opens up to Grayson as to why he's chasing a command position … and then we're back to the cave. Mercer's patience as he tries to talk reason to the Krill is impressive — she's stubborn, to say the least. Turns out, though, that a day on this planet is 23 Earth days long, so while Teleya remains in the cave, Mercer will have to risk getting to higher ground on his own. Capt. Ed Mercer (Seth MacFarlane) faces an unpleasant truth when he's confronted by the Krill Teleya (Michaela McManus), whom we first met in the Season 1 episode "Krill." The Orville picks up the distress signal that Mercer sends, and once in the planetary system a shuttle is dispatched. In a race against time, Teleya must face going into the daylight with only Mercer's jacket to cover her exposed head. The rescue is a success, and doing the humane thing, Mercer allows a Krill cruiser to come and collect Teleya in the hope that this gesture will go some way to one day establishing peace. Aside from a terrible choice of song at the end, the script, the story and even the cinematography make this one of the best episodes of "The Orville" so far. However, the danger this series runs is that it adds nothing new to an existing sci-fi — or more often specifically a "Star Trek" — trope. And just being a love letter to '80s pop culture, while fun and entertaining, is not enough. Previous episodes like "Krill" (S01, E06) or "New Dimensions" (S01, E11) were thoroughly entertaining, and "Majority Rule" (S01, E07) was an idea that had been tackled recently — most memorably in the "Black Mirror" episode "Nosedive" (S03, E01). But "About a Girl" (S01, E03) and even "Ja'loja" (S02, E01) add a little something extra, so we'd like to see more of that, please. Season 2 of "The Orville" is on Thursdays at 9 p.m. ET on Fox in the U.S.. It can be watched on demand on Fox Now and Hulu. It's also available on Fox.com in the U.S. In the U.K., it's on Thursdays at 9 p.m. GMT on Fox. The first season of "The Orville" is available to buy on DVD, and a season pass can be purchased from Amazon.